If you missed Tuesday’s event, you can still hear from the experts to learn how to deliver a seamless connectivity experience for the thousands of people coming through your venue. 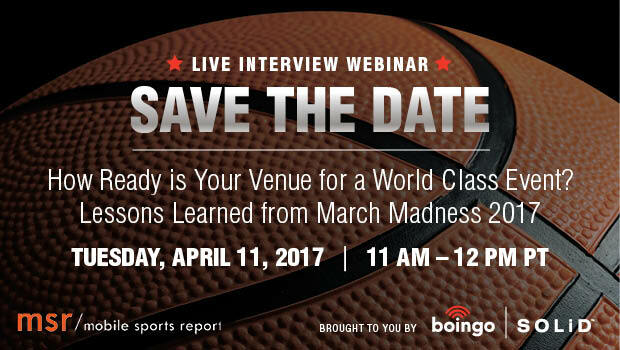 Listen to the replay of this Mobile Sports Report “Live Interview” webinar for exclusive access to insights from March Madness host Vivint Smart Home Arena and connectivity partners Boingo and SOLiD. If you have any questions please contact Paul at kaps@mobilesportsreport.com. Come hear what was an interesting discussion! 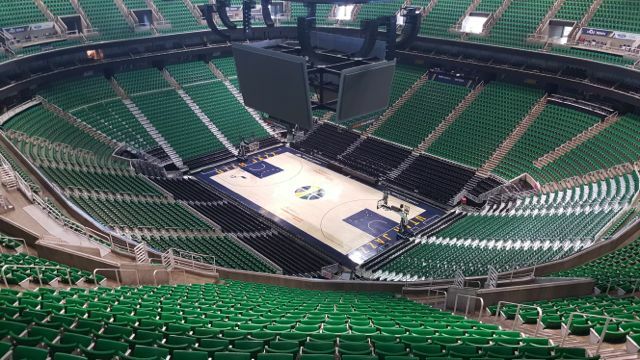 A $130 million overhaul of Vivint Smart Home Arena provided the perfect opening to refresh its wireless infrastructure as well — so the venue installed new DAS and Wi-Fi to improve the game experience for fans of the NBA’s Utah Jazz. 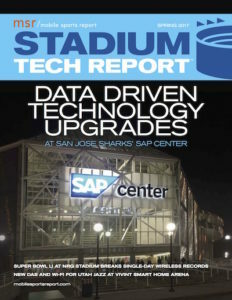 “When we understood we’d be undertaking both a renovation and improving guest experience, we realized a severe lack in the Vivint bowl for guest wireless,” said BJ Vander Linden, CIO for Larry H. Miller Sports & Entertainment, which owns the downtown Salt Lake City venue as well the Jazz franchise. Wireless was an afterthought, if it was thought of at all, when Vivint was first built in 1991. “We knew we needed something more interactive for guests to watch, share and talk about the game and give them more opportunities to be involved,” Vander Linden told Mobile Sports Report. Editor’s note: Come hear the Utah Jazz, Boingo and SOLiD talk about the new network inside Vivint Smart Home Arena during MSR’s first LIVE INTERVIEW WEBINAR on Tuesday, April 11! Register now for this event! 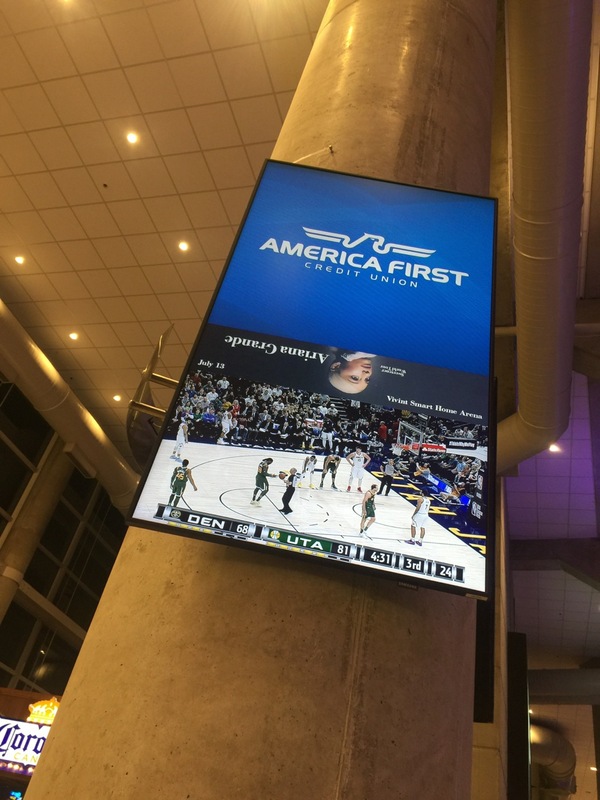 This wasn’t the first time that Miller Sports and the Jazz had considered Wi-Fi upgrades for Vivint, which had been using a lightweight Cisco switch and about 20 APs. “A few years ago, we looked at Extricom, Xirrus and Ruckus, but we weren’t willing to fund the project at the price points offered then,” said Aaron Cook, vice president of information technology for the Jazz. Since then, Jazz officials talked with other NBA teams about their Wi-Fi experiences, which is when Cisco and Aruba (now part of HP Enterprise) emerged as frontrunners for Vivint’s upgrade. “We went up and looked at the Portland Trailblazers’ infrastructure and had both vendors talk about pricing and engineering designs,” Cook said. 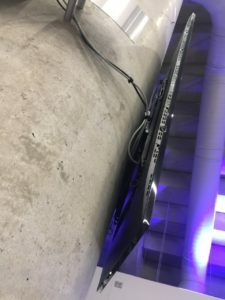 Aruba-HPE emerged as the winning supplier for Wi-Fi access points; Aruba’s engineering partner, M S Benbow & Associates, also helped tip the scales in Aruba’s favor, with Benbow’s particular expertise in sporting venues. Surveying for wireless in the Vivint arena began in summer 2016, and installation began in November, owing to the demands on the arena’s schedule and non-Jazz bookings. The biggest engineering challenge was the halo ring for the arena’s center scoreboard, where the Jazz installed several APs. “We needed to get [the halo’s] wiring completed first and had some events that limited when it could be lowered,” Vander Linden said, since the arena needs to be empty to lower the halo. “We needed a few days or a week to leave it down so that Benbow and our local electricians could put things in place,” he added. 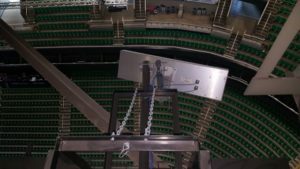 In addition, Vivint’s lines of sight meant the Jazz only needed overhead APs inside the arena’s bowl, avoiding the expense and additional engineering required with under-seat APs. Most of the engineering was otherwise pretty straightforward, according to Josh Barney, director of technology and innovation for the Jazz. “We had to revisit our Level 6 plan, which is the top concourse with suites. There are corner boards and LED boards, so we had to revisit how we’d mount antennas,” he added. Benbow re-engineered the antennas so that they were inside the boards and then aimed back down toward the seats. As of this writing, there are 108 active APs in the Vivint bowl; 32 of those hang from center halo. Ongoing demolition and construction in the concourses render those areas inaccessible til July when they’ll also be outfitted with Wi-Fi, Vander Linden said. That will give the Jazz a grand total of around 250 APs when the NBA season ramps up again in October. “We have a friends-and-family ‘beta test’ going on right now,” he noted, with an invitation to Jazz season ticket holders to test the new Wi-Fi and submit feedback. New Cisco switches and an upgrade to Cat 6a cabling brought the Wi-Fi budget to about $1.2 million, Vander Linen confirmed. The Vivint renovation also allowed the Jazz organization to rework a DAS system installed in 2002. Working with Boingo and DAS gear provider Solid Inc., Boingo built two DAS networks, one for fans’ use, as well as a commercial public-safety DAS that’s part of the arena’s emergency preparedness strategy. 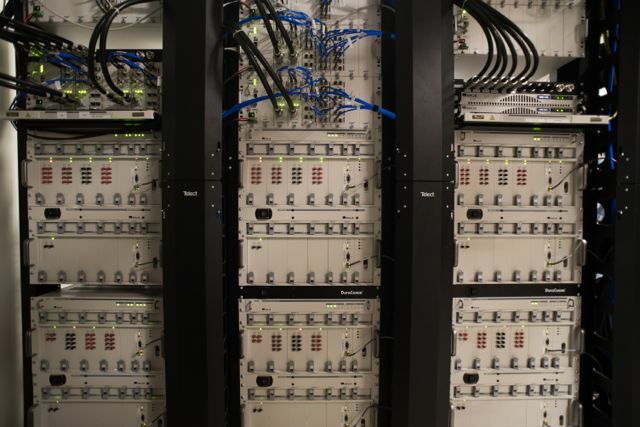 All four major cellular carriers (AT&T, Sprint, T-Mobile and Verizon Wireless) have capacity on the new 10-zone DAS system; 105 DAS antennas blanket the Vivint arena, according to Boingo, which is also managing the Jazz’s DAS infrastructure. 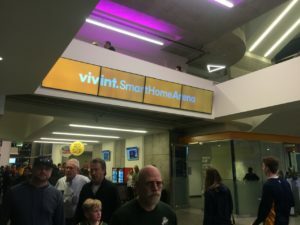 Vivint’s new scoreboard had a lot of “unfriendly RF characteristics,” according Doug Lodder, senior vice president for business development at Boingo. “As we were designing and installing the DAS, we had to be cautious and ensure our antenna setup and network would not be impacted by the scoreboard,” Lodder said. And bowl-based DAS often means there are fewer ideal areas to install the necessary wiring. To reduce the length of coax runs to the antennas, Boingo installed Solid’s new 2-watt remotes directly on the catwalks. Vander Linden is also preparing to re-launch the venue’s mobile app. And given that the Jazz is the arena’s top tenant in the building, he said they’ll do one of two things: It will either be handled as a single app for just the Jazz, or it will be like the Sacramento Kings’ app that embraces both the arena and the team. Yinzcam developed the Jazz’s existing app; it’s unclear if they’ll handle the upgrade, according to Vander Linden. (Orlando’s app, for instance, is developed by VenueNext.) Vander Linden wants to have the new app in place and ready to go by mid-September. Vivint also has Bluetooth low-energy beaconing built into its wireless upgrade plan as well. “We’ll be putting up beacons over time as we can and testing and determining the right way to go,” Vander Linden said. He thinks wayfinding would be valuable for letting people know where things are around the arena, but he’s also appropriately circumspect with the fledgling technology. “We’re aware from talking to other arenas and providers that it’s a learning experience,” he laughed.